To supporters, it's simply a way to help corporations be good citizens and combat America's childhood obesity epidemic. To critics, it's the latest example of "nanny state" overreach by the federal government that could cost money and jobs. The issue? 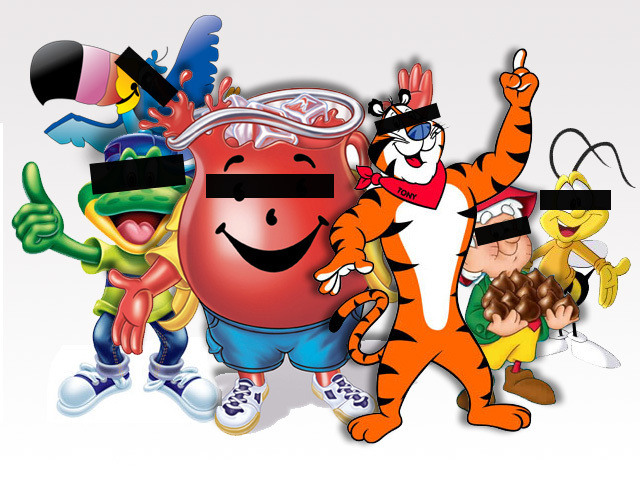 A proposed set of voluntary guidelines backed by the Obama administration designed to limit the marketing of junk food to children through mascots like "Tony the Tiger," the smiling animated figure used for decades to sell Kellogg's "Frosted Flakes" breakfast cereal. Under the guidelines, companies would only be able to advertize and promote healthy foods low in fat, sugar and sodium to kids from ages 2-17, though the final set of guidelines will likely only range up to age 12. Food companies, which spend roughly $2 billion per year marketing to kids, have been lobbying hard against the proposed guidelines, which were proposed by an array of government agencies. They've found an ally in House Republicans, who are seeking to force the Federal Trade Commission to study the potential impact of the guidelines before adopting them. Many companies - including Kellogg Company, Burger King Corp., Kraft Foods and The Coca-Cola Company - already participate in a self-regulation program for ads targeting kids under 12, which is called the Children's Food and Beverage Advertising Initiative. But Margo Wootan, a nutrition scientist at the Center for Science in the Public Interest and backer of federal government guidelines, suggests the initiative has little impact because individual companies set their own guidelines. In other words: If a company sells products low in sugars but high in sodium, she says, they simply tailor their guidelines to their products, setting a strict standard for marketing sugary products but a loose standard for marketing salty ones. The proposed set of government guidelines, Wootan argues, would mean a standardization that would force them to actually stop marketing unhealthy foods - and "expose what they have been doing on food marketing is not nearly as meaningful as they make it out to be." "They couldn't keep saying they're not marketing to kids so easily," she says. Wootan stresses the voluntary nature of the guidelines, noting that the government is not imposing them on the companies. But Republican Rep. Jack Kingston of Georgia worries about voluntary becoming mandatory in the future. "What's voluntary today becomes a regulation tomorrow," Kingston says. He complains of a "nanny state" push to "regulate Honey Nut Cheerios." Kingston says the government is being hypocritical by seeking to limit the advertizing of certain foods to kids while simultaneously allowing those foods to be consumed through the Food Stamp program and the WIC (Woman, Infants, Children) program that provides grants to states for supplemental foods. If the foods in question are "so bad and evil," he argues, "then by all means eliminate them from the federal government nutrition programs." "If they have serious evidence about the dangers of Fruit Loops, they need to present that to us," he adds. Kingston, who describes Michelle Obama's anti-obesity effort as "one of those little projects that the first lady has chosen" that has had little real impact, complains of a potential situation in which "you could watch [MTV explicit teen drama] Skins, but you can't watch a Fruit Loops commercial." He says efforts to reduce childhood obesity should be focused on creating a "culture of health," in part through encouraging more exercise. Republican Rep. Jo Ann Emerson of Missouri - who stresses that she isn't "a right wing, radical conservative by any stretch" - also opposes the guidelines and looks skeptically at claims that they will remain voluntary, arguing that "we all know that things that started as voluntary somehow become the rule of the land." (Wootan points out that the Congress barred the FTC in 1980 from issuing industry-wide regulations on advertizing.) Emerson also says it is reasonable to seek a cost/benefit analysis before proceeding. "Every single regulation where we don't know how much it's going to cost the industry creates more uncertainty," she says, arguing that the guidelines could ultimately cost jobs. Her chief of staff, Jeffrey Connor, complained that the standards are "aggressive" and are "excluding products that have healthy benefits especially compared to what else is out there." Opponents of the guidelines are seeking to include a provision in the FTC budget requiring the cost/benefit analysis to adopting the guidelines; that budget needs to clear both the House and the Senate. If the guidelines are put in place, Emerson says, "suddenly you can't advertise water or Gatorade on some sports show because somebody who's under 18 might look at it? I mean, come on, this is outrageous." "There are some folks in government today who just because we're unable as the American people to make our own decisions itself," she adds. Wootan looks at such claims incredulously - asking, "how do voluntary standards constitute government overreach?" - and says she expects the final guidelines will only cover kids age 2-11, with standards for teens only applying in schools. She also says critics are "cherry-picking" examples of relatively healthy foods that could be affected by the guidelines, such as wheat bread with high levels of sodium, in order to distract from the larger issue as well as the negative health effects of many foods marketed to children. "I know that there is a sizeable group in Washington these days that are very concerned about government overreach," she says. "...but you know, they should be happy with this approach. Because advocates like me, we're not asking for the government to step in to fix this problem. What we're doing is relying on companies to manage the problem themselves." The FTC says it expects the guidelines, if implemented, would encourage companies to make their foods healthier by, for example, reducing sugar and increasing whole grains in cereals. According to the Centers for Disease Control and Prevention, 17 percent of children and adolescents in the United States are now obese - triple the rate that existed 30 years ago.